I’ve been offline for a while – grad school decisions have been coming out lately, and I’ve been in the middle of researching schools, scheduling meetings, and so on. But the Umbrella Movement is still making regular headlines. Just today, another massive banner reading “我要真普選” (I want true universal suffrage) reappeared on Lion Rock! Check out the video at SocREC. I had the chance to hike Lion Rock with my auntie here, her husband, and my boyfriend. It was a real treat and a great experience – we saw monkeys and two wild boars! 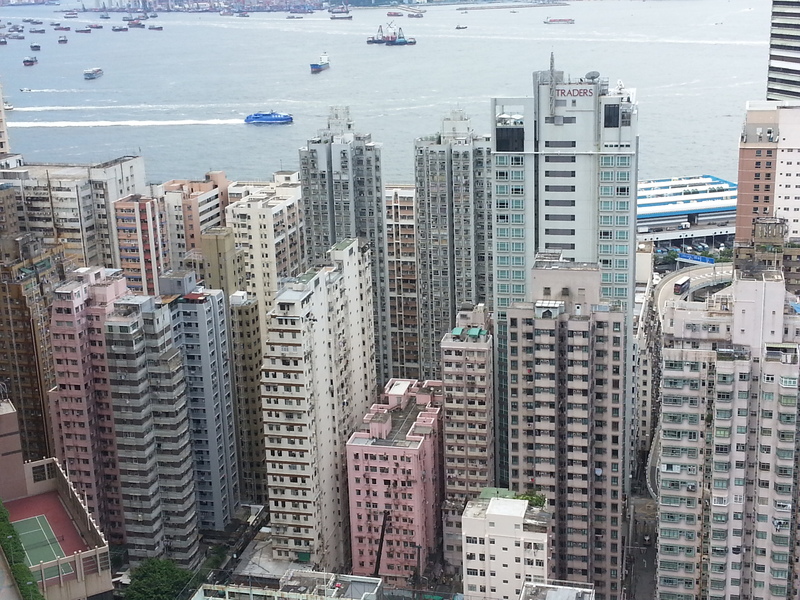 – that really made me appreciate what it must have been to put up those huge banners on such a critical symbol of Hong Kong. (The theme song “獅子山下精神” played at the Lunar New Year fireworks on Friday night – a strong reminder of what that song and the rock means in the city’s official narratives.) We made it up to the lion’s shoulders all right – lots of stairs – but getting to the head, where the banners have been hung, takes a bit more rock climbing than hiking. It’s kind of a nice thing to see the banner up. It’s like a reminder of what the movement stood for, a call back to 勿忘初衷 (don’t forget the original purpose). And this is especially critical at this moment, where the pan-democratic camp is so deeply fractured. 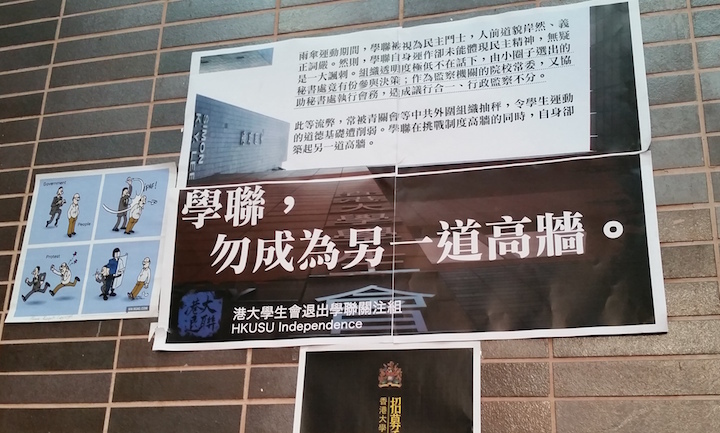 HKU students recently organized and won a campaign to withdraw from the Hong Kong Federation of Students – similar campaigns occurred on at least six other campuses. Here’s the HKU group’s Facebook page, 港大學生會退出學聯關注組 (HKUSU Independence). They’ve been around since late last December, when they first proposed withdrawal from HKFS (see a translation of their proposal, published in Passion Times, here). 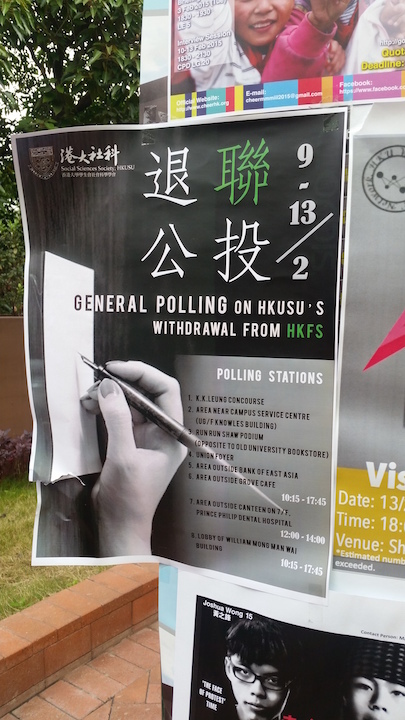 I attended a debate at HKU on the subject on February 5, shortly before the week-long referendum began. There were two representatives for (and from) HKFS, Alex Chow and Yvonne Leung, and two representatives against HKFS, HKUSU Independence founder 吳偉嘉 (Oscar Ng) and another male student surnamed 王 (Wong Chun-kit). Throughout the debate, Alex Chow seemed testy and exhausted – and understandably so. He wasn’t wearing his trademark glasses, which I imagine was an attempt to avoid immediate identification and/or confrontations by random passersby. Meanwhile, Oscar Ng spoke more clearly and confidently; to me, it seemed that his partner offered weaker arguments and rebuttals. HKFS’ historical stance toward Mainland China. At the accusations of being undemocratic and non-transparent, Alex Chow argued that reforms were possible in HKFS. 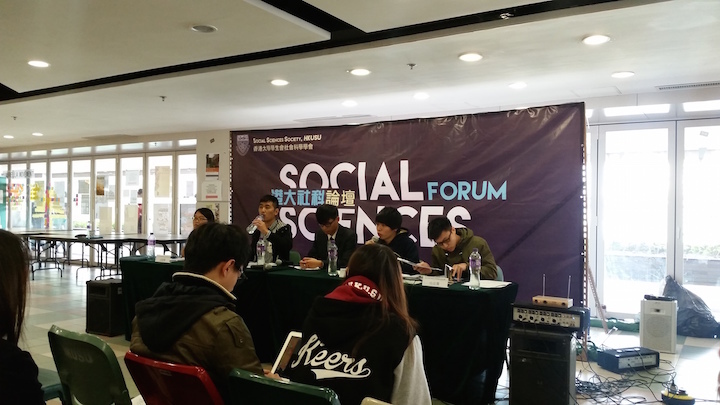 Regarding HKFS’s stance toward China, he noted that the organization has a long history of social and political activism, and he argued that its stance changed over time according to the students. Still, Oscar Ng criticized HKFS for promoting the notion of a democratic Hong Kong for a democratic China – the idea that was popular in the 1980s, which Martin Lee also discussed, which argues that if Hong Kong is democratic, then it can help influence and support the democratization of the mainland. Seeming harried and tired, Alex Chow returned again and again to the question: What would you really achieve by leaving HKFS, other than fracturing the best platform that currently exists for communication between students across Hong Kong? An excellent question that, to me, has not yet been answered. It is rather sad, I think, to see this course of events. Here’s a translation of Apple Daily‘s commentary about the results, “Lessons for Pan-Democrats.” I also read about this year’s contentious HKUSU election, in which one candidate, Eugenia Yip, was criticized as a Communist infiltrator for having been born in the mainland (here’s an article from Reuters that helped kick it into international news, and another piece about it in Foreign Press). She protested that she had come to Hong Kong because she cared about its democratic system – indeed, she was practicing democracy. Her team lost. In other news, Joshua Wong recently made an appearance at my alma mater, USC, in relation with a new documentary, Lessons in Dissent. Wish I had been there, considering that I missed the showing at HKU! I’m certain that this is only one of many, many documentaries to watch – there are so many other videos created by news sites like Al Jazeera or CNN, along with videos made by local NGOs or religious groups. You did not miss the screening of LESSONS IN DISSENT at HKU. It takes place at 2:30 on Monday, March 2, in room 142, Main Building. Hope to see you there! Oh!! Thanks so much for correcting me! I’ll absolutely be there.